I have spent ages looking for a good red velvet chocolate chip cookies recipe and I think I have nailed it finally. A bright, Valentine’s Day take on traditional buttery, crunchy shortbread biscuit. 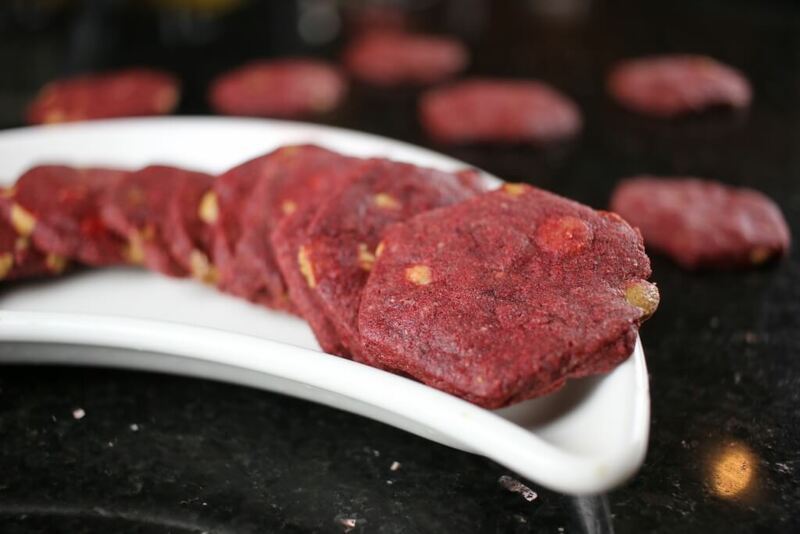 Traditionally the red velvet colour is created by a reaction between cocoa powder, vinegar & buttermilk. Unfortunately as virtually all cocoa powder in shops is processed, the reaction doesn’t happen & we need food colouring to make it happen. 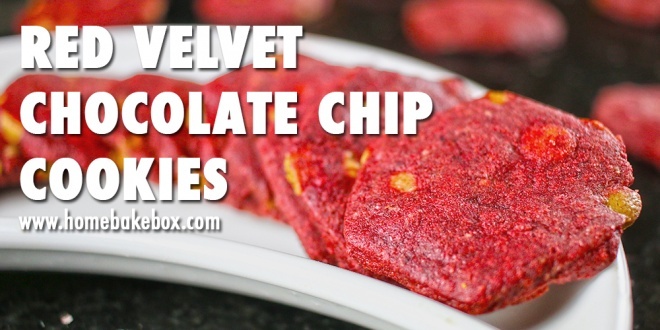 Try this red velvet chocolate chip cookies recipe today. It is delicious. We have used white chocolate chips in this recipe but you will be fine with any chocolate chips really! In a mixing bowl, use your hands to work together your flour, caster sugar, cocoa powder and vanilla with 100g softened butter. With your hands, work in 70g of white chocolate chips until they’re evenly spread throughout the dough. On a floured surface, lay out your dough ball, and use the palm of your hand to flatten it a little bit. Add a few drops of food colouring spread evenly over your shortbread dough. Use your hands to work the dough. It will take a fair amount of kneading and elbow grease to get the colour spread evenly throughout the dough, but it will get there eventually. (Optional) If you don’t want your cookies to spread out too much chill your cut out cookie shapes in the fridge for 20-30 minutes. If you don’t mind them spreading out a bit, you can put them straight in the oven. Remove from the oven and allow to cool. They will be quite soft when they come out of the oven but will crisp up when they cool. And please don’t forget to tag us in your bakes @homebakebox on Instagram and Twitter. And drop us a post on Facebook too!